Kids Country is a STAR 3 facility. Kids Country Childcare Learning Center is a designated Keystone STARS 3 facility because of our strong commitment as we provide high quality care and early education to young children. Keystone STARS is a program recognized for building a solid foundation for children’s successes in school and life. 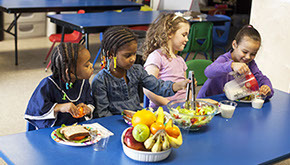 Kids Country participates in the USDA Child and Adult Care Food Program (CACFP). Thought the CACFP (Child and Adult Care Food Program) we provide all meals. Our meals must meet nutrition standards established by the U.S. Department of agriculture (USDA). Kids Country offers healthy meals to all enrolled children. The CACFP provides reimbursements for healthy meals and snacks served to children enrolled in child care. As long as Kids Country childcare center participates in the CACFP, all meals will be provided at no extra cost. ​ Kids Country is PAAC Approved! Kids Country participated in an Autism Sensitivity Training provided by PAAC founder Michelle Meaney-Demarsh. Kids Country staff members were provided basic education, facts about autism and specific interventions we can use to better accommodate specific child and family needs. Kid's Country Inc. is a childcare learning center located in Pocono Summit, PA. Our high quality childcare center is committed to encourage and support children to be life long learners. 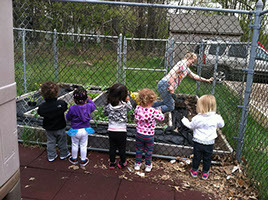 We take a holistic approach to educating and nurturing each child in a developmentally appropriate atmosphere. We aid in their development by offering experiences through play and enhancing their social, emotional, physical, and cognitive development in a safe, healthy, loving, and nurturing environment.